Welcome to part two of the Outbreak Developer Series. This series of topics will focus on exploring different aspects of the Outbreak game experience. We're here to talk about the player inventory view in Outbreak. 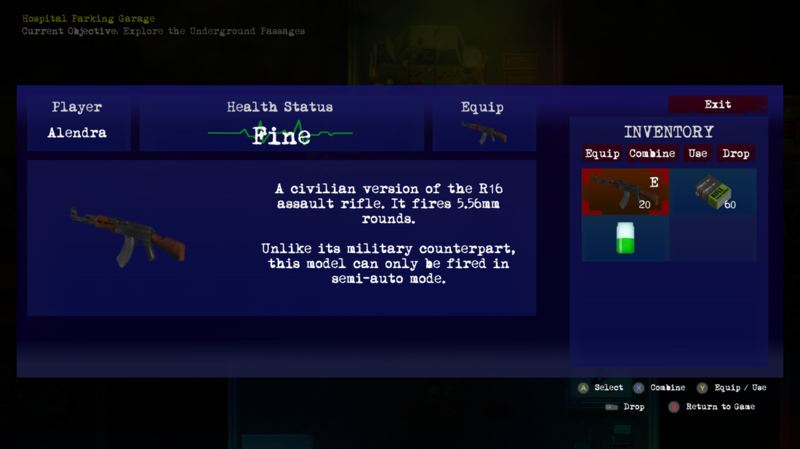 It is your primary view of the state of your player including health, equipped weapon and your overall inventory. 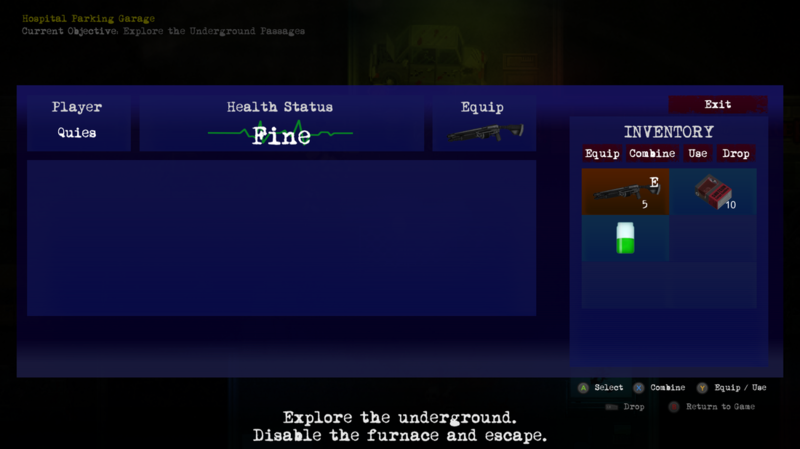 An extremely limited inventory is a classic tool to ratchet up the tension in survival horror games. When you're stuck choosing between being well armed, well supplied with ammo and healing items or carrying an important puzzle piece, it forces you to make hard decisions. Outbreak follows the same mold. The inventory screen displays important information about your character. It shows you your player name, your current health, your equipped weapon and the current items in your inventory. It also contains an explanation of an item when it is selected. This explanation often times includes important information like which weapons ammo is compatible with, how to use a puzzle item or how to combine healing items. The player's health is displayed as an EKG read-out and has several states. These are Fine, Warning, Caution and Danger. When you die, your health will read as Dead in the separate lobby view. You cannot see an exact health display, instead you can only see these general states. All characters have different damage resistance and will take damage at different rates. All players except for Quies can carry 4 inventory items at one time. Quies is unique because she can carry up to six items at one time. All items that you can pick up take a single slot. Some types of items, like ammo, can be combined into the same slot up to a certain amount. For example, you can currently hold up to 60 handgun bullets in a single slot. You can perform four options on the items in your inventory. Equip allows you to select a weapon and equip it for use. When a weapon is equipped, it can either be fired or swung depending on the type during gameplay. Firearms require ammo. Melee weapons have a fixed durability and will eventually break. Certain weapons, ammo and items can be combined together. Guns can be combined with their associated ammo type for a quick reload. Healing items can be combined together to create more effective types. For example, a Green Salve and a Red Salve can be combined to form a Purple Salve. Green Salve on its own only heals a little bit of your health, but a Purple Salve will restore it completely. Read the descriptions for items and test out different combinations to see what you can make! The use button allows you to consume healing items and use puzzle items. To use a puzzle item, stand in front of the puzzle until you see the exclamation point above your character. Then enter your inventory, select the correct puzzle item and use it. If successful, you'll see visual feedback displaying that the action was successful. Note: You cannot use weapons or ammo directly from the inventory! Since your inventory space is limited, you'll often need to clear space by dropping items. When you drop an item, it appears on the ground at your feet. You or another player may then pick it up. You cannot drop a weapon while it is equipped. A separate menu from the inventory view is the Lobby view. 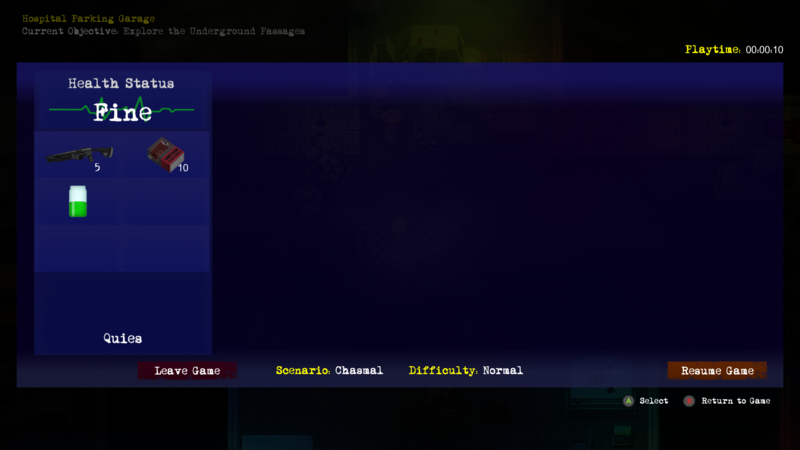 The Lobby view displays the inventories of all players in the game. It will allow you to see what items and weapons other players are packing when playing together. The Inventory View is an extremely important tool in Outbreak. It provides up-to-date information on the state of your character and equipment. The game does not stop when you're in your inventory and it purposely obstructs your view. You'll need to make sure you're in a safe location before using it. Outbreak © 2016-2018 Dead Drop Studios LLC. All Rights Reserved.